I had a hard time picking just one comfort sweet! I’m going to go with my first impulse, Rose Levy Beranbaum’s Bittersweet Cocoa-Almond Genoise from The Cake Bible. “The story is that Jan Smeterlin, the eminent Polish pianist, loved to cook. And he collected recipes. This is one that was given to him on a concert tour in Austria. Third, there’s just something about this cake- it’s dense yet soft and tender, supremely moist, and I love the flavors- chocolate balanced perfectly with toasted almonds. Sometimes I add a tablespoon of dark rum, or a little instant espresso. When it’s gone, I’m always left wanting more. Last, it’s versatile- it keeps for days, and can be simple (like the tube pan version) or elegant (like the torte finished with whipped cream and chocolate shavings, or Maida’s version with dark ganache). This flourless genoise is one of my all-time favorite chocolate cakes. This time I tried a five-egg version in a 6 cup tube pan (recipe calls for a springform) and it baked up beautifully, reaching an internal temp of 204-205 F in 40-45 minutes. I used King Arthur toasted almond flour for this, which worked wonderfully, and full-fat cocoa powder, which is important for the best texture and flavor balance in this cake. This is a not-too-sweet cake, with a supremely moist, dense-yet-soft texture. Delicious. 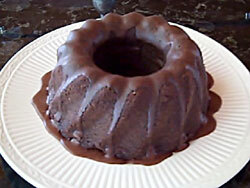 The glaze was 1/4 cup of light whipped ganache left over from the barquettes, which I melted. Unlike the ungreased torte version, I prepared the tube pan by spraying with Baker’s Joy, and cooled the cake in the pan for about 30 minutes before unmolding. Instead of baking strips, I set the tube pan inside another, larger pan to insulate the sides. With the shorter baking time, it doesn’t need any cake strips or foil to cover the top. I’ve also noticed that I like the texture best with blanched almonds (though unblanched work well, too), and the finer the almond flour, the lighter and more cake-like the texture becomes. With a coarser grind, the interior is still delicious, but very moist, closer to a custard. This is my take on Rose Levy Beranbaum’s Bittersweet Cocoa-Almond Genoise (The Cake Bible, page 134). Because it is scaled to fit a 6-cup tube pan, volume measurements don’t work out to even numbers. If you have a second mixer bowl, it will come in handy for beating the egg whites. 1. Preheat oven to 350F and spray a 6-cup tube pan with baking spray with flour (or grease and flour). 2. If you need to make almond flour from sliced almonds, first toast them until lightly colored, 5-7 minutes at 350 F, then cool to room temperature. Subtract 1/4 cup sugar from the amount that will be creamed with the butter and process almonds with the sugar using long pulses in the food processor. Process until fine, but stop before the nuts become pasty. 3. Whisk the boiling water and cocoa until smooth, stir in the vanilla and rum (or espresso), cover and allow to cool to room temperature. 4. Cream butter and sugar until lightened in color. Mix in egg yolks until blended, then the cocoa mixture, then the almond flour. 5. With a clean bowl and beaters (no grease), beat the egg whites, salt and cream of tartar to soft peaks. Gradually add the sugar and beat to stiff peaks. 6. With a spatula, fold 1/4 of the whites thoroughly into the cocoa mixture to lighten it. Then gently fold in the rest of the whites and pour into the prepared tube pan. 7. Bake 40-45 minutes to an internal temperature of 205 F. The top of the cake will flatten slightly at the end of the cooking time. 8. Cool cake in the pan for at least 30 minutes, then gently invert onto serving plate to finish cooling. Because the cake is flourless, it will shrink while cooling. Melt the cream and chocolate together, stir in the rum, and allow to cool to glazing consistency, 1 to 2 hours at room temperature. Drizzle over cooled cake. i am so making this for my gluten-free friends. thank you. bee and jai, you won’t regret it. This is addictive, and my husband’s favorite cake. For a totally gluten-free cake, just grease the tube pan rather than grease/ flour. I just made this cake out of the Cake Bible, hopefully it will turn out. Next time I will totally be using your rum idea, that sounds amazing! A friend made this for me because I am gluten free, it is a slice of heaven.